My passion is language development, theoretical linguistics and speech-language pathology; my vocation is internal medicine and my avocation is the neuroscience of functional brain imaging. I jump back and forth between all three disciplines because of my quixotic quest to discover the inner workings of the human brain. Not too long ago, at Columbia University’s Program for Imaging and Cognitive Sciences, after working with technology to restore speech in patients with stroke and traumatic brain injury, I heard the call to reach out and help children with autism. 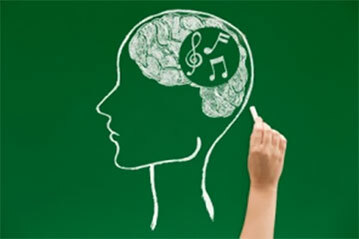 Although we have been using novel language learning methodologies and brain neuromodulation – cutting-edge techniques to be sure – one of the fundamental modalities of our language restoration program is the incorporation of music. We have been using science and research investigations to discover what parts of music –rhythm, melody, harmony – will help a child on the spectrum acquire language better and faster. Everything we have learned so far supports Maria LaMon’s approach to using music to help children on the spectrum. She puts her knowledge of motivational techniques to reinforce her music teaching methods on a daily basis – each day a sort of ‘clinical trial’, so to speak – to discover what works best. She has shared her observations with me and there is little doubt her VMC program’s approach to teaching keyboard to children on the spectrum is on the right track. As a specialist in using neuroimaging to discover brain areas and their connectivity in children on the spectrum – and then using these findings to implement treatment plans that have met with success – I would enjoy collaborating with Maria in an investigational study that might demonstrate changes in the brain brought about by her unique teaching methods: areas of the brain responsible for language in children with autism. I continue my own investigational research into music theory and how it may be incorporated into the neuroscience of linguistics and language acquisition. I have learned that music often shares the same ‘real estate’ as language within the brain, but the emotional effects of the kind of music that Maria teaches often occupy separate brain areas that may also facilitate language production. Maria and I shall have much to discuss as we go along this journey of music and the brain and language.